Iron Bow Healthcare Solutions offers a suite of Managed Care services focused on assisting clients with the sustainment of their telehealth program. Managed Care is designed to enhance program success, increase customer satisfaction and remove IT complexity, allowing healthcare organizations to focus on their core mission. Iron Bow offers three tiers of Managed Care support. 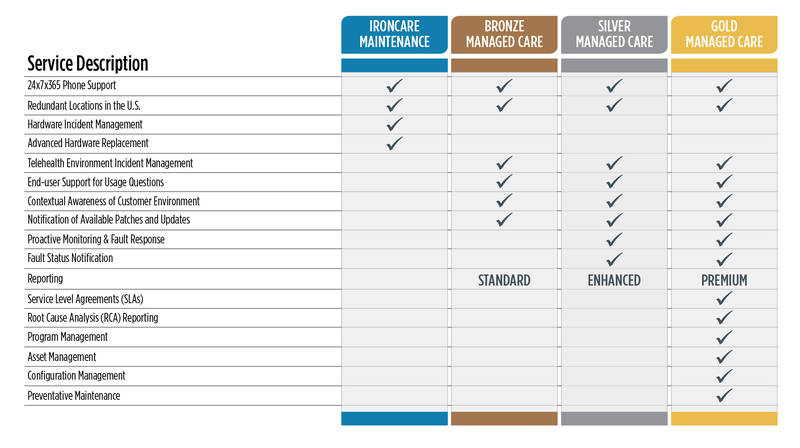 Bronze Managed Care supplements IronCare Maintenance to provide 24x7x365 telephone support through Iron Bow’s Client Service Center (CSC) and provides end-to-end telehealth system troubleshooting assistance. While IronCare coverage addresses the operational state of the specific device, Bronze Managed Care enhances support by assisting the client’s telehealth support organization with diagnosing system-wide performance issues and faults. Silver Managed Care incorporates all the elements of Bronze, but adds active system monitoring for the next level up-time management. Gold Managed Care provides comprehensive support and management of the client’s telehealth program and provides an SLA-based option to ensure rapid fault resolution for critical care environments.